I woke up on our 4th day in Saint Petersburg with ballerinas on the brain. The night we would go to the Mariinsky theater to see Swan Lake, starring one of Russia’s Prima ballerinas, Diana Vishneva, had arrived. The Mariinsky, now in its 229th season opened in October 1860. Music by Tchaikovsky (and other famous Russian composers) was heard here for the very first time. I was so excited I couldn’t stand it! 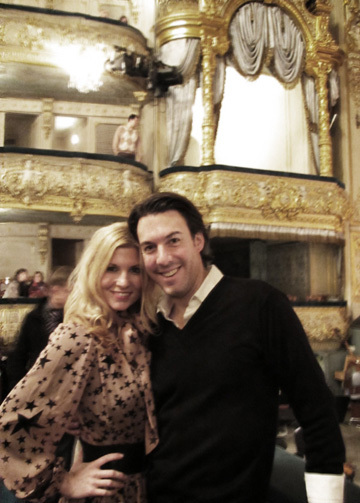 But it was still hours before curtain call…we had plenty of time to explore more of Saint Petersburg! So – to the Yusupov Palace we went. 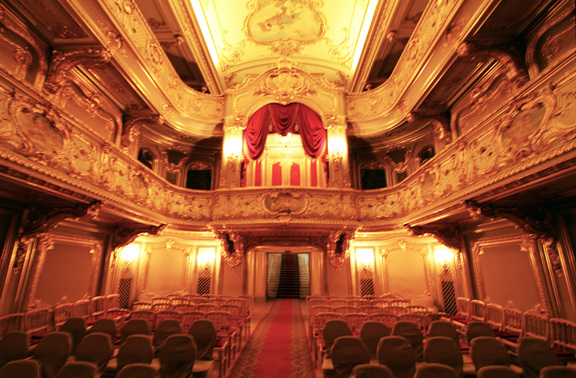 While the ballrooms and music rooms of the palace were rather magnificent, it was the private theater that amazed us most. Can you imagine having such a theater room in your home for you and your closest friends? Much less one with its own “tsar box”. A bit pompous to say the least! 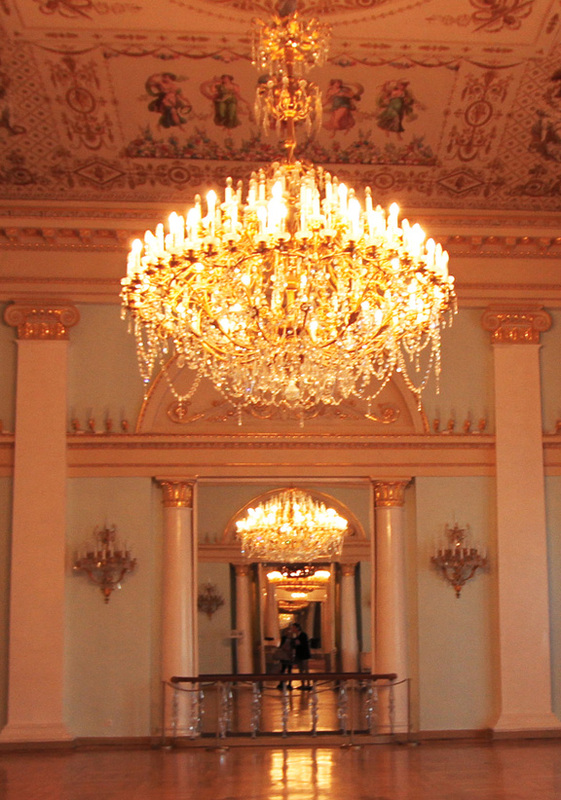 The Yusupov palace was one of our favorite sites in Saint Petersburg. In addition to all of its splendor, its history is remarkable. Knowing that Rasputin was murdered within its walls just before the start of the revolution gives it an extra eerie and mystical feeling. I highly recommend it! We worked up quite an appetite touring the palace – so we headed to a nearby restaurant for a late lunch before returning to the hotel to get ready for our night at the theater. I honestly can’t say that Brett and I are ballet connoisseurs, but I don’t think that one has to see a million ballets to know that Diana Vishneva is the real deal – a real show stealer. Her movements are nymph like – graceful and absolutely beautiful. It is hard to take your eyes off of her. That paired with the perfect backdrop of the Mariinsky Theater created a truly magical moment. A quick photo opportunity during one of the two intermissions. They flutter around so much that it was very difficult for me to snap any clear images. That said, I actually like the way the pictures turned out. I think they show just how quickly the dancers pirouette about. Following the ballet, we went to The Russian Empire Restaurant. 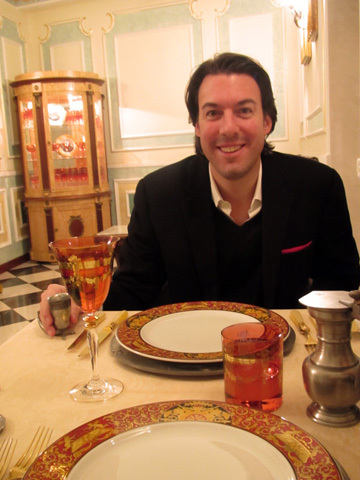 While the style of the place is a bit clichéd, we couldn’t resist having a meal inside the Stroganov Palace. Where better to have Beef Stroganoff, am I right? There is a famous “tale” told of Catherine the Great visiting the palace for a dinner in which the Count promised her the most delicious olive in the world. As it turned out, her olive was basically served to her in the predecessor to the Turducken. As the story goes…she was first presented a full cow, within it a full pig, within it a full lamb, within it a goose, and so on and so on until a tiny squab held inside the most perfect and delicious olive within it. The restaurant tries to keep this legend alive by serving what I considered to be an extremely tasty olive. Stuffed with sturgeon and served in a succulent sauce, it offers a very unique and enjoyable flavor. So although, The Russian Empire is not avant guard in terms of modern cuisine or style, I would still recommend it. In a city like Saint Petersburg…it is actually quite fun to be a tourist – to allow yourself to live and dine as Russian Royalty. Wow, fantastic photos! I wish I looked that good in pics (or in mirrors, for that matter)! Hello from a fellow Vishneva fan!